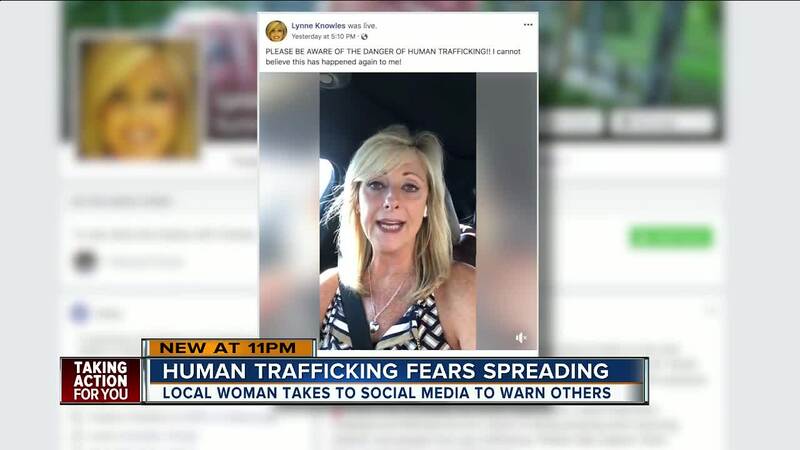 DUNEDIN, Fla. — A Florida woman is taking to social media to warn others about a potential human trafficking tactic she recently encountered at a local grocery store. Lynne Knowles says a man followed her through several aisles at her neighborhood Publix, recording her with his cell phone. "I was so scared and felt so uncomfortable," said Knowles. "It made me very nervous and I purposely went down an aisle that most men wouldn't go down and he popped up on that aisle too." After confronting the stranger, Knowles says he ran outside where two other men were waiting in the parking lot. Since then, she says several friends have come forward with similar stories. Knowles' 3-minute video has been watched by more than a million people in 24 hours and shared more than 40,000 times. "I've had a lot of women come to me today and say that they were going to go out and get a gun permit and get a gun," Knowles said. WFTS also uncovered another Tampa-area mother warning others about a strange man taking pictures of children at International Plaza. Tampa Police say mall security did contact them about the incident, but they have not found any unlawful behavior. "We have to protect ourselves and make sure we are completely aware of our surroundings at all times," warns Knowles.